In October, some 8,000 people converge on Stagecoach Village to browse booths set up by local restaurants. Eat yourself happy in an outdoor party atmosphere that includes live music and a beer garden. 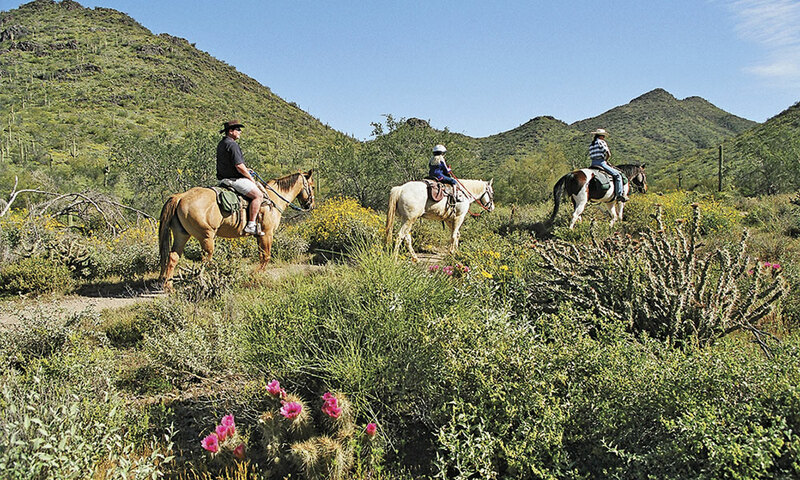 Residents of Cave Creek revere the town’s frontier beginnings and love the way it blends with the bohemian present. The two combine to make a community where locals—loud, proud and ready to buy a round—call themselves Creekers. Located 33 miles north of Phoenix, the settlement of 5,500 landed on military maps as early as 1870, when it was a cavalry remount station on the road from Fort McDowell to Fort Whipple, 116 miles north. The Old West comes alive the first weekend of November with Wild West Days. 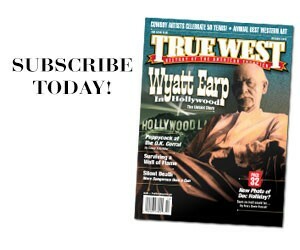 The three-day bash draws 10,000 people and features the Battle of the Bars bull-riding competition, a parade, pig races, gunfight re-enactments and quick-draw competitions at Frontier Town. The latter has original wagons and antiques, and several small shops, including Cave Creek Candles & Gifts, which ships across the world, and Debra Ortega’s Native American Jewelry & Arts. oldest and biggest mining operations in the Cave Creek area, the Golden Star Mine/Golden Reef Mine on nearby Continental Mountain, began in the 1880s. 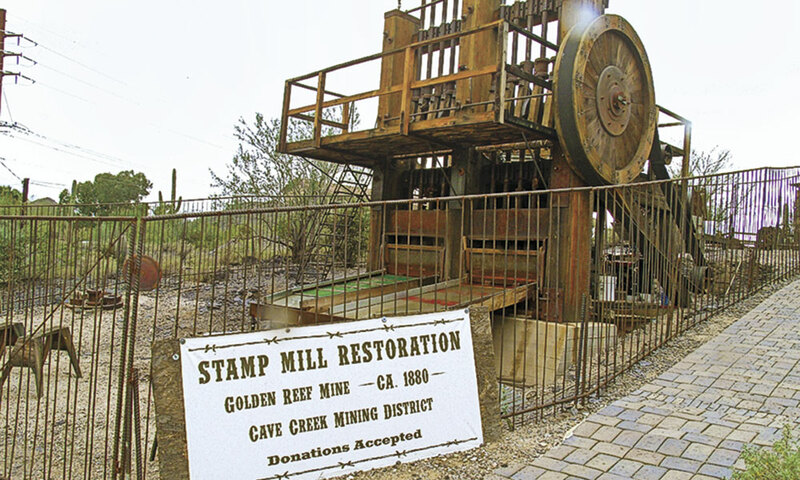 Today, the mine’s famous stamp mill has been restored and operates once a month at its permanent home on the grounds of the Cave Creek Museum. One of the most popular Wild West Days events is the Mutton Bustin’ competition at Buffalo Chip Saloon & Steakhouse. Watch kids ages 4 to 7 ride sheep, just like grown-up cowboys ride bulls. The Chip also offers adult bull-riding on Wednesday and Friday nights, if you dare. Once owned by Green Bay Packers star Max McGee, the saloon is headquarters for Packers fans watching NFL games. Two spring events demonstrate the town’s unique blend of eras and interests. 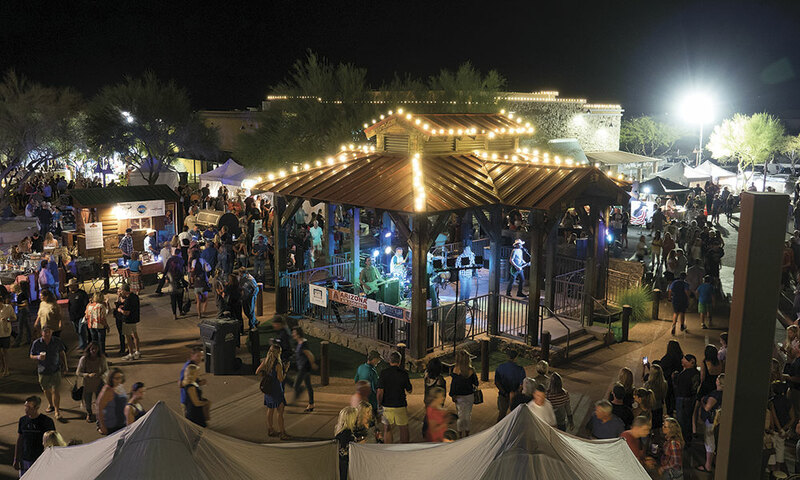 Cave Creek Rodeo Days offers a week of excitement, including a PRCA rodeo at Memorial Arena, and Arizona Bike Week generates a wild kind of fun as thousands of motorcyclists converge on two local institutions, the Hideaway Grill and The Roadhouse. “It’s quite a sight to see one lane of Cave Creek Road closed to accommodate the cyclists riding into town,” says Patty Villeneuve, president and CEO of the Carefree/Cave Creek Chamber of Commerce. Visit the Cave Creek Museum to inspect its 17½-foot tall Golden Reef Stamp Mill, the only fully operational 10-stamp mill in its original mining district in Arizona. And see the last remaining tuberculosis treatment cabin, built in the 1920s and furnished with period items, now listed on the National Register of Historic Places. The museum also showcases an extensive pottery collection dating from the Hohokam and Puebloan people to the present. “We have quite a few historical and archaeological items,” says Johnson. “People are surprised by the magnitude of our collections.”Visitors find the town’s restaurant options surprising, too. “You can get anything you want here and that includes places catering to foodies,” says Villeneuve. Ancient petroglyphs can be found on foot or horse in the Spur Cross Ranch Conservation Area north of Cave Creek. Trek to the top of a mesa to see a prehistoric Hohokam compound and enjoy the view across miles of pristine desert. Among them are the Tonto Bar & Grill at Rancho Manana, Le Sans Souci, Cartwright’s Modern Cuisine and Calakmul, specializing in Mexican and Latin American dishes. For those who like to eat as opposed to dine, there’s barbecue at Harold’s Cave Creek Corral, which opened in 1935 as the Corral Bar to serve the workers building Bartlett Dam. The Horny Toad slings great fried chicken and its strawberry shortcake has won awards. Creekers show their creative side with arts and crafts events almost every winter weekend. Don’t miss the Hidden in the Hills Studio Tour & Sale, hosted by the Sonoran Arts League. Held over two weekends in November, the event allows visitors to meet artists in their studios and buy their work. Last year’s tour featured 173 artists in 44 studios in Cave Creek, Carefree and North Scottsdale, making it Arizona’s largest studio tour and sale. For a scenic trip, drive 24 miles to Bartlett Lake Reservoir in Tonto National Forest. Few sights match the beauty of a glittering-blue desert lake surrounded by saguaro-studded mountains. Leo W. Banks is an award-winning writer based in Tucson. He is the author of the mystery novel, Double Wide. 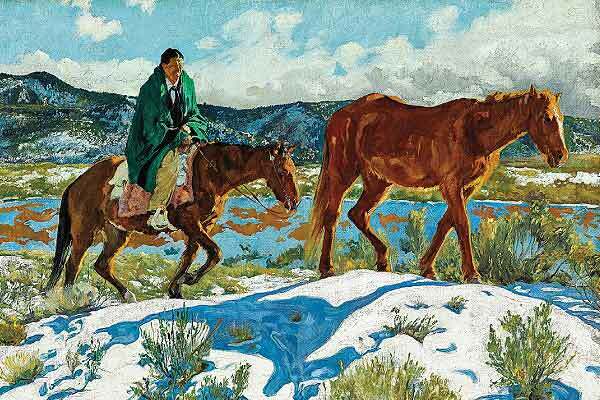 Endless Rides Wilderness wanderers riding pioneer trails found an easy road at end-of-the-year artwork auctions. 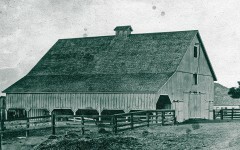 A Barn Worth Saving A group of San Diegans preserve another forgotten piece of California history. 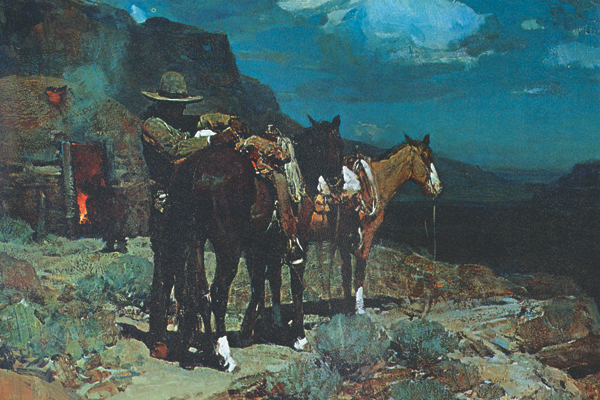 Sings in Color Frank Tenney Johnson’s hallmark nocturnes remain unequalled.